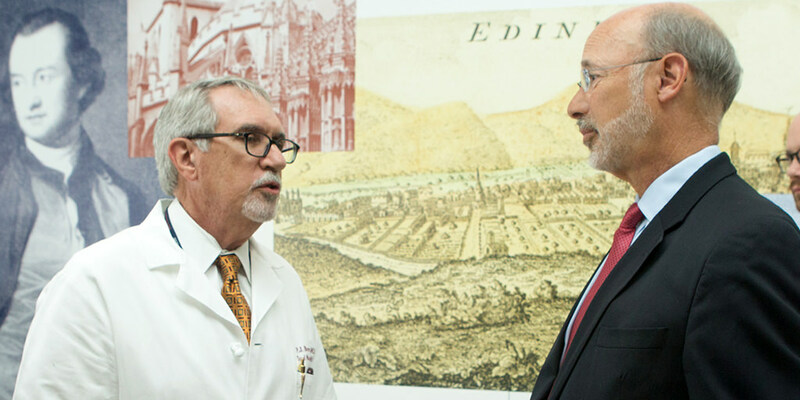 Harrisburg, PA – Governor Wolf today will award $1 million grants to four organizations to build medication-assisted treatment programs for Pennsylvanians suffering from the disease of addiction. A formal announcement will be made at Pennsylvania Psychiatric Institute, a collaboration between Penn State Health and UPMC Pinnacle, 2501 N. Third Street, Harrisburg, at an 11:45 a.m. press conference today. Gov. Wolf will be joined by Dr. A. Craig Hillemeier, CEO of Penn State Health, dean of Penn State College of Medicine and Penn State’s senior vice president for health affairs; Acting Secretary of Human Services Teresa Miller, Acting Secretary of the Department of Health and Physician General Rachel Levine; Acting Secretary of the Department of Drug and Alcohol Programs Jennifer Smith; and physicians from Penn State Health associated with the grant and addiction program.